My Clan’s name and its mysteries, have been kept out of public knowledge and history in my homeland of Australia. It’s the way The Clan work. To achieve their goals, secrecy is a prerequisite to safeguard the work and people. I, am what some in the Clan call the favoured, because I now have the power - via the written word, to ensure that our efforts are remembered: and not just by the Clan, or those few they have made themselves known to. For the first time in our extensive, oral history, we have a means to reveal the long and intriguing history of our covert Clan to other Australians; to the many new people’s who now call this majestic land home – and to the modern world at large. If you were born in Australia, you may have even heard such stories told around campfires and family meals: about the Australian Aboriginal magic man – or Kadaicha, as our Clan were named by our people many years ago. We call ourselves: The Fethafoot. It was passed down, that the Fethafoot arrived here, not long after the start of time as we know it - in our now-Dreaming. This current era, which followed the Dream-time creation period. It was a time when the language creatures – humans - became proud and selfish. So egoistically insular, so quickly - that they forgot, why they were given time and space here for. 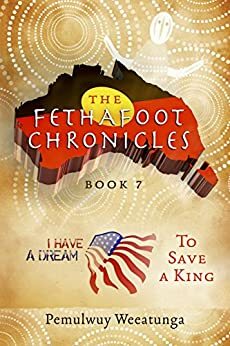 Fethafoot warriors’ were trained to support the ancient Dreamtime design: to guide the very formidable language creatures toward dignity - and respect. Proper respect: for the heavens, The Mother-earth and each and every creature that depended upon their balance. Then and only then, it was said: their mutual connection with that holy trio, would assure balance and a healthy, unbroken Dreaming across our land. From its ancient beginnings, the Clan began to seek, analyse and utilise any and all martial-art, magic, weaponry or mind skill, that their information-hungry warriors came across. Many of the elder, long-trained warriors were advanced in spirit-travel and did not travel via Shank’s pony - as the act of walking is often called in Australia: “how’d ya get ere mate? Ahh, Shank’s bloody pony Dig! Me bloody orse broke down mate,” they’d say. Instead, these old clever-men used the ancient Dreamtime ‘creation-lines’ running across our country, to move swiftly across their lands. Thus, in a mixture of fear and awe, real and imagined, the Clan came to be known as The Fethafoot: half-man, half-spirit beings who could come and go at will, leaving no trace: Kadaicha spirit-warriors; The dreaded Fethafoot. This pithy glimpse will give you some idea of the enigmatic Clan - and you will discover a more intricate use of their unique gifts and talents as you read the chronicles – and as the need for their unique, various individual skills occur. Please - enjoy my people’s pleasure in the telling of these legends. Although they are not in chronological order, they have been recorded as passed down, for all to enjoy - and to example the many unknown, vibrant treasures’ of our first people and our land’s vibrant past. It is a journey that will also take you into the mostly unknown, moral and ethical heart of my people, from Dreamtime to now. Pemulwuy Weeatunga is the pen name John M Wenitong chose for the Fethafoot Chronicles series. Born in Gladstone, Queensland, Australia, John is an indigenous Australian man of Kabi Kabi Aboriginal and South-Sea Island origin. His Australian indigenous mob is caretakers of the mainland area from approximately the Fraser to Moreton Islands area of the SE-Queensland coastline. John's mother - Aunty Lorna Wenitong - started the first Aboriginal Health Program out of Mt Isa in the late 1960s and his younger brother, Mark, one of the first indigenous Doctors in Queensland, is credited with being the mind behind AIDA in Australia. John, now in his early sixties, has four children aged from their teens to their late thirties, and six wonderful grandchildren. He plays guitar, photographs nature, writes poetry and songs, and occasionally tries to sing. Who could think up a tale like this! Simply breathtaking action. Fact or fiction? I enjoyed it from go to whoa & I can't wait to read the other chronicles in this series. 1.0 out of 5 stars$11.99 for 64 pages. Are you kidding mate? $11.99 for 64 pages. Are you kidding mate? I am not even going to look at this.